Harris County Public Library (HCPL) is a public library system serving Harris County, Texas, United States. Since its inception in 1921, HCPL has grown from a system of small book stations in homes, stores and post offices to 26 branch libraries serving a population of over 1.3 million users in unincorporated areas countywide. HCPL has a collection of over 2.5 million items and circulated over 9.7 million items in fiscal year 2014. Edward Melton is the director of the library system. HCPL operates branches in several cities which do not have library systems of their own and in unincorporated parts of Harris County. Three branches are located within the city limits of Houston, in sections that have been annexed since the branches opened. Most of Houston itself is served by the Houston Public Library. The county library system is headquartered on the property of 5749 South Loop East. It is in a 83,385-square-foot (7,746.7 m2) one story building. It was formerly headquartered at 8080 El Rio Street. 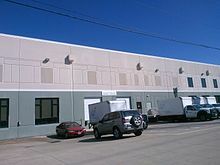 At a later time it was headquartered at 9220 Kirby Drive, within the Corporate Centre Kirby in Houston. The branch serves Greenspoint. An expansion and renovation was scheduled to be completed in January 2001. The branch is a joint project between HCPL and the Lone Star College System. ^ "Locations." Harris County Public Library. Retrieved on May 1, 2017. " Library Administration 5749 South Loop East, Houston Texas, 77033"
^ "Harris County Capital Improvement Program Fiscal Year 2014-2015" (PDF). Government of Harris County. p. 15 (PDF p. 26/47). Retrieved 2017-05-01. ^ "About HCPL" (Archive). Harris County Public Library. Retrieved on June 1, 2010. "Location: Library Administration 8080 El Rio Street Houston, TX 77054"
^ "Locations." Harris County Public Library. Retrieved on January 31, 2016. " Library Administration 9220 Kirby Drive Suite 100 Houston Texas 77054 "
^ "Supplemental Notice of a Public Meeting" (Archive). Government of Harris County. March 10, 2015. Retrieved on February 20, 2016. p. 11/32: "Request for approval of an agreement with Warehouse Associates Corporate Centre Kirby II, Ltd., for lease of space at 9220 Kirby Drive for the Harris County Public Library for the period of June 1, 2015-May 31, 2016 at an annual cost of 486,000,[...]"
^ a b c "WORTH READING ABOUT / Construction work under way on Barbara Bush branch library." Houston Chronicle. Wednesday September 20, 2000. ThisWeek 1. Retrieved on December 9, 2011. ^ "Atascocita CDP." U.S. Census Bureau. Retrieved on october 17, 2009. ^ Beust, Brenda. "The Dirt On Houston's BLOOMS." Houston Chronicle. Thursday March 6, 1986. Weekend Preview 1. Retrieved on December 9, 2011. ^ "." Baldwin Boettcher Branch Library. Retrieved March 9, 2018. ^ "." Barbara Bush Branch Library. Retrieved March 9, 2018. ^ "." Katy Library. Retrieved March 9, 2018. ^ "" Maud Smith Marks Branch Library. Retrieved on March 9, 2018. ^ "." LSC - Tomball Community Library. Retrieved on March 9, 2018. Wikimedia Commons has media related to Harris County Public Library. Many places on this list are not in the corporate limits of the City of Katy, but instead are unincorporated areas with "Katy, Texas" postal addresses. This list includes items within or related to the U.S. Census Bureau-designed Spring census designated place (CDP) and places outside of the CDP with "Spring, Texas" postal addresses. Items within or related to areas outside of the CDP are italicized. This list does not include places without "Spring, Texas" postal addresses. The community college district has no locations with Spring, Texas addresses but is listed anyway since it broadly serves residents of the CDP and others with "Spring" addresses. The public library has a location outside of the CDP and with a "Spring, Texas" address, Barbara Bush Branch Library, while the nearest library to the CDP is Baldwin Boettcher Branch Library at Mercer Park, which has an "Humble, Texas" address.